By Leena Miller Cressman, QSY Director. You can find Leena teaching Slow Flow on Monday nights at 5:30pm. Her classes include exploration of balance and joint proprioception, aspects of the Tensegrity Repair Series, and space for deep breathing and relaxation. As a kid, I always loved learning new words. I loved the sounding out the unfamiliar configuration of letters, and discovering a new way to describe or convey the meaning of something. I still love new words, and this is one of the many reasons I love studying and exploring anatomy and physiology, it gives me the chance to learn all sorts of new (and sometimes strange) words and ways of describing the human body. Like gastrocnemius! Listen to it pronounced it here. It is just so much more fun to say than “calves”. Interoception: Our perception and sensing of internal sensations, feelings, movements, and responses of the body. If you sense a pang of hunger in your belly, or notice pounding of your heart when you’re nervous that is introception. It is the opposite of exteroception, which is an external sensation on the body, like feeling wind in your hair, or the warmth of your hand in your pocket. Proprioception: Comes from the latin “one’s own”. It’s our sense of where our body is in space. It’s our ability to sense the relative positioning of our joints, joint angles, and muscle length, and to feel our movement and what will bring greater equilibrium. Proprioception is what allows you to feel how deeply bent your knee is in Warrior 2 without looking at your leg, or allows you to navigate a dark, unfamiliar room at night. By Leena Miller Cressman, QSY director and resident body-nerd. 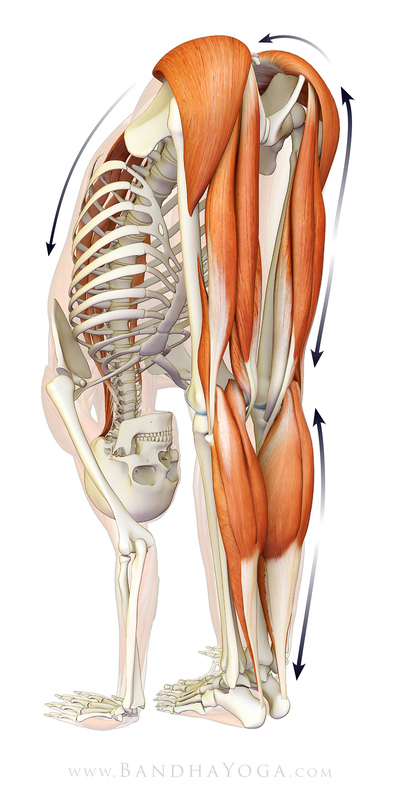 One of my favorite well-informed yoga/anatomy-nerd bloggers, Jenni Rawlings, recently had a great blog post and video exercise reminding yogis to strengthen their hamstrings. A lot of yoga sequences and postures encourage flexibility and lengthening of the posterior chain of muscles, specifically the hamstrings. posterior chain can become shortened in that resting position. When it comes to mobility, when you don’t use it you lose it. This post and sequence was created by Leena as a follow up to last week’s post on #Selfcare, Restorative Yoga & Community Acupuncture. The first few weeks of September are this funny in-between time. We’re on the threshold of transitions: the end of vacations, the weather turning (eventually) from summer to fall, back to school, back to routine, etc. Here at the studio we are gearing up for a packed fall schedule of special offerings, including lots of great pre-registered courses and a nearly sold-out Yoga Teacher Training program.